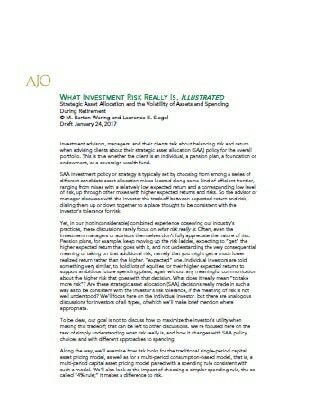 Investment advisors, managers, and their clients talk about balancing risk and return when advising clients about their strategic asset allocation (SAA) policy for the overall portfolio. This is true whether the client is an individual, a pension plan, a foundation or endowment, or a sovereign wealth fund. SAA investment policy or strategy is typically set by choosing from among a series of different candidate asset allocation mixes located along some kind of efficient frontier, ranging from mixes with a relatively low expected return and a corresponding low level of risk, up through other mixes with higher expected returns and risks. So the advisor or manager discusses with the investor the tradeoff between expected return and risk, dialing them up or down together to a place thought to be consistent with the investor’s tolerance for risk.